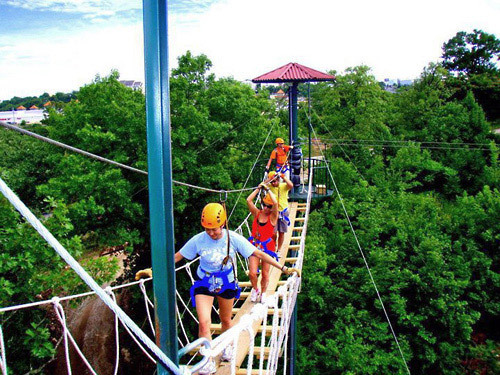 As the only zipline adventure tour in Branson, Adventure Ziplines of Branson offers adrenaline junkies an exciting experience ideal for any age or group. 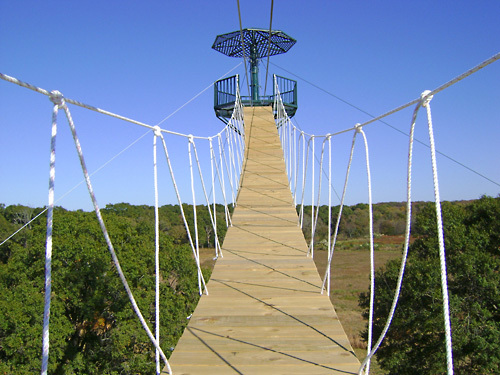 Guests can soar 70 feet above the ground at up to 50 miles per hour on one of the seven ziplines, offering stunning views of the area during the ride. 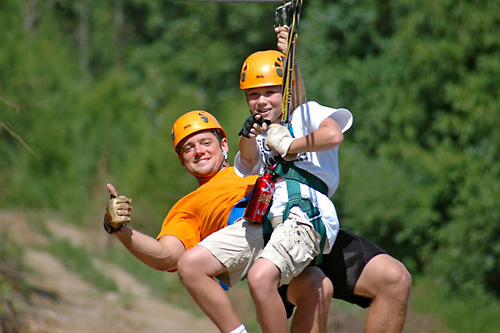 The experience lasts for two hours and includes complete zipline ground school training. Wear comfortable clothing but not too loose and MUST wear closed toe shoes. Arrive early to go over safety guidelines. 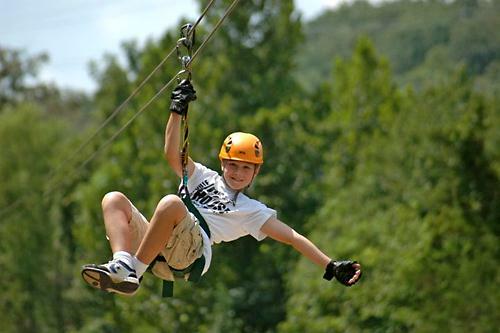 Most affordable zipline course in Branson. The only zipline in Branson you can ride upside down! Adventure Ziplines of Branson is conveniently located in the heart of Branson behind the Tanger Outlets, just off the famous 76 Strip. Each tour includes 7 breathtaking ziplines, three rope bridges, and an ATV ride led by one of our certified guides. Our solid steel construction zipline towers meet or exceed ACCT standards and we only use the highest quality of equipment available, which is checked daily by our expert guides. Book today and prepare to make memories that are sure to last a lifetime! The weight limit for this adventure is 275 lbs. After completing your purchase you will receive an email confirmation that includes a telephone number. The first available tour time will be 24 hours following purchase. Will I be very high during the zipline adventure? 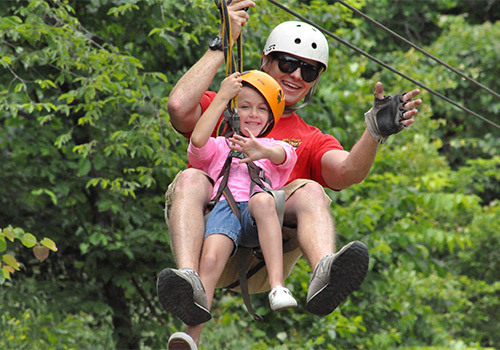 The average zip line adventure will take you anywhere from a few feet, to over seventy feet high, where you can get a great view of the Branson forest canopy! Almost all adventure trips, including things like rock climbing or white water rafting, carry risks with them. Our course was designed to be as safe as possible. We use only the highest quality of equipment available, and everything is checked daily by our experts, who are also professionally trained. We do everything that we can to make sure that you will be as safe as possible during your adventure. How long is a zipline adventure? If you’re taking a tour, you’ll likely spend around 1 1/2 hours at the tour. It takes about 20 minutes to complete orientation and training. 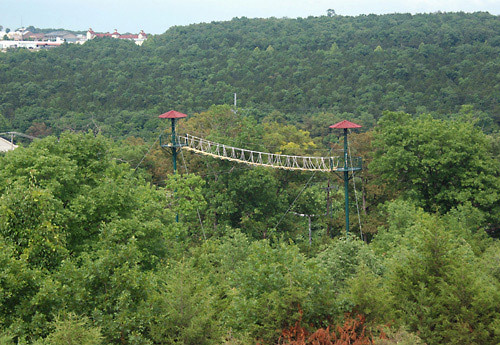 The canopy tour tends to take around an hour and a half to complete. You will get to ride all 7 zip lines that range from 450 to 2,000 feet long. Do I have to do a lot of walking or hiking? Not much at all. You need to walk about 300’ to our training area and first tower. 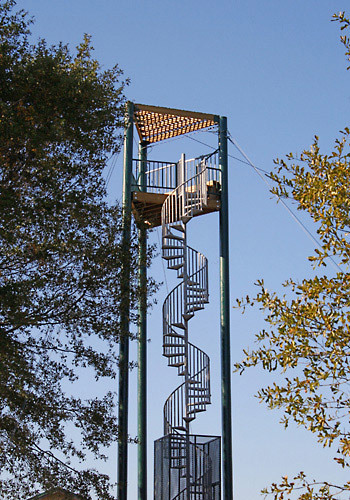 There are two towers that have circular staircases, one has 45 steps and the other has 65 steps. After you complete the 7th line, you will be transported in a Polaris ATV back up to our Lodge to view your pictures. Can anyone go on a ziplining tour? Our tour is designed for use by anyone who is over the age of three (children this young will tandem ride with one of our experienced guides or confident and responsible parent). You must be over seventy pounds to ride alone. 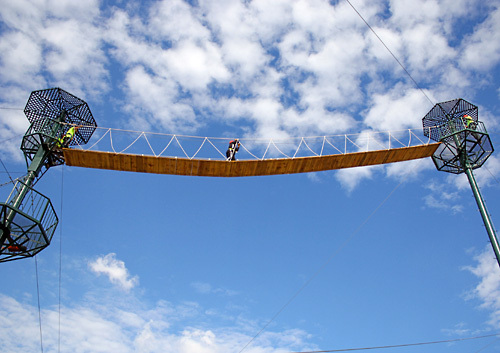 The zip line is able to carry passengers who are between the weight of seventy and two hundred and seventy-five pounds. 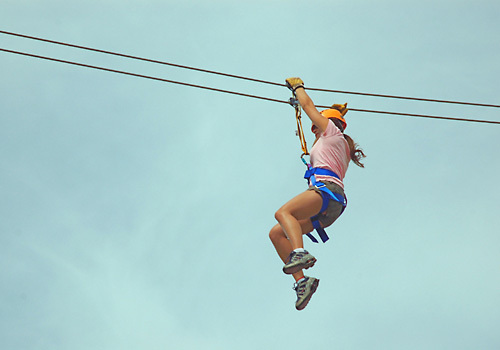 It is requested that participants in a zip lining tour are in average health with no heart or back problems that might result in a worsening health issue. Can you go on a zip lining adventure when you are pregnant? No, if you are pregnant you will not be allowed to go on a zip lining adventure, but we hope that you will contact us about an adventure after you have had your child. When you’re planning on going on a zip line adventure, the first thing that you need to do is to make sure that you are wearing comfortable clothing. Skirts are not permitted unless you are wearing shorts or pants under it, and you should not wear any type of jewelry that dangles. Close-toed shoes are required and anything that’s loose, like scarves, should be removed. If you have long hair, it should be tied back, and you should take everything out of your pockets, including cell phones, so that they do not end up hopelessly lost on the floor of the forest. Do you still offer zipline tours in cold weather? Yes! The temperature can drop when you’re going on a zip line during the winter months, so make sure that you dress appropriately. Thick socks, a warm jacket that can zip up, a warm winter hat, thermal underwear, and even a face mask can be helpful if you’re going to be on a zip lining adventure in the winter months. Do I have to wear any special equipment? Your guide will fit you securely into a seat harness. You’ll also be given a helmet, gloves, a trolley system, which is what moves you throughout the cables, and 2 lanyards that have safety clips on them. How about the rain? Can I go down the zip line in the rain? You can go down a zip line in the rain, but not if there is any lightning. We try to make sure that we contact everyone who is booked for a zip lining adventure in the event of a storm. If your adventure is canceled due to inclement weather, you can opt to reschedule. Can children under three zipline? No. Children must be at least three years of age to zipline. We can have up to twelve people per tour. If your group consists of less than 12 people, you will likely be paired up with another small group. That is totally up to you but it is common industry practice to give a tip to your guide. If they have provided you with the experience that you were hoping for, it is normal for a guide to receive a 10-15% tip per person.